🙋‍♂️ Need help in buying 273914-B21, HP Smart Array 6404/256 Controller? Please contact us now. 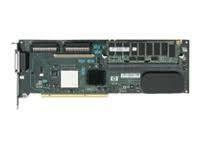 4-Channel raid controller supports upto 56 disk drives. 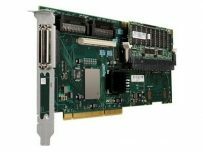 The Smart Array 6400 high performance Ultra320, PCI-X controller family provides maximum performance, flexibility, and reliable data protection for HP ProLiant servers, through its unique modular design and support for Advanced Data Guarding (RAID ADG). This performance Smart Array controller again raises the standards of performance, introducing Double Data Rate (DDR) battery-backed write cache architecture and a new RAID engine. Designed and tested with industry standard ProLiant Servers for greater reliability, this controller is ideal for workgroup and departmental servers. And like other Smart Array controllers, the SA-6400 features complete data compatibility with previous generation’s Smart Array controllers for easy data migration from server to server and for controller upgradeability.